This fantastic cabin awaits your family for fun and adventure! Centrally located in the Garden Valley area, close to swimming, hiking, ATV/Snowmobile trails, restaurants, but very private with a hot tub with surrounded by beautiful firest views. The fabulous gourmet kitchen has plenty of room to cook that great family dinner. All on one level, great for the grandparents, too! 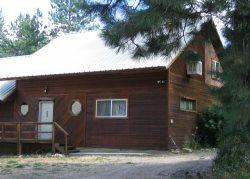 With three private bedrooms, all with queen beds and two futons in the sun terrace of the living room, this cabin sleeps 10. The living area and adjacent dining area and wet bar, make social gatherings a snap! Enjoy the starry skies while soaking your cares away in the hot tub on the rear deck! For those that need to stay in touch WIFI is available and satellite TV provides viewing of the games during the winter season! Bring your toys, there is plenty of parking and you can ride out from the cabin in any season and access miles and miles of trails. C'mon - make some lifetime memories today! Karen was great to work with. Thanks for helping us find such a great place! liked packet and key box. Will rent again, loved the room.